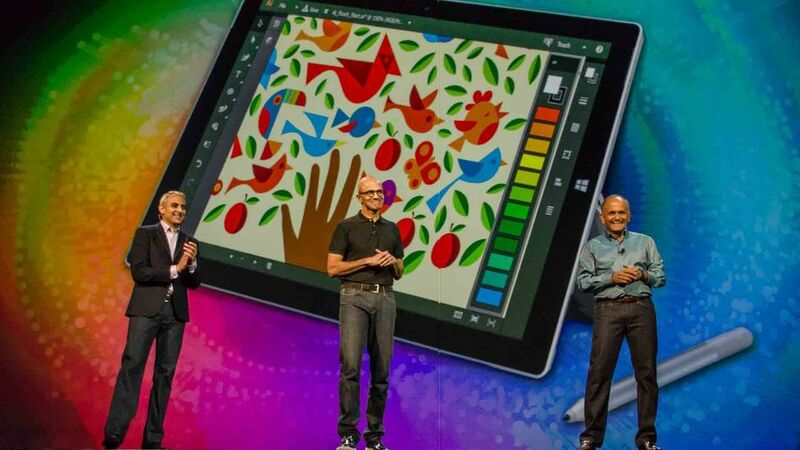 David Wadhwani, Adobe’s senior vice president and general manager of Digital Media, Microsoft CEO Satya Nadella, and Adobe president and CEO Shantanu Narayen onstage during the keynote presentation at Adobe’s Max conference in Los Angeles, Oct. 6, 2014. Microsoft’s problem with mobile has largely been a software one. As the company has learned, it’s not enough to make powerful tablets or phones if the software isn’t there to support it.But Adobe might be able to help. Though the two have worked closely together in the past, it wasn’t until Microsoft CEO Satya Nadella took the stage with Adobe CEO Shantanu Narayen during Monday’s keynote presentation at Adobe’s Max conference, that it was clear the two companies have a closer partnership than ever, which may signal big changes for Microsoft’s Surface platform. That the two would want to work together closely is not a surprise. 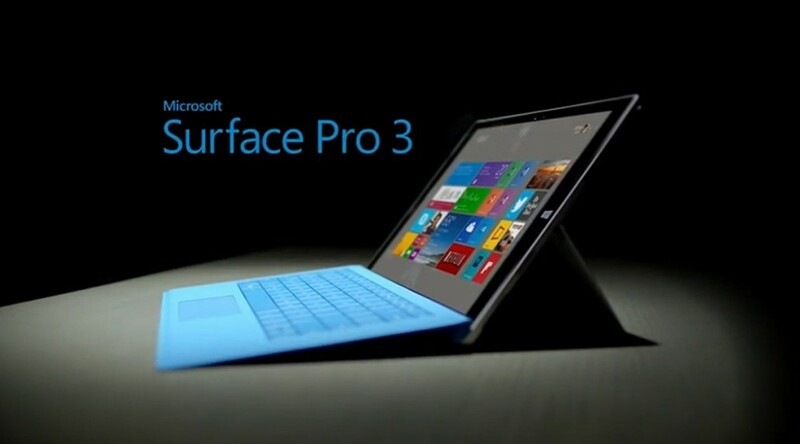 Microsoft’s Surface Pro 3 has much more advanced software capabilities than iPads an other tablets — ideal for resource hungry applications like Photoshop and Illustrator. The two companies also showed off Project Animal, a new animation app that has Kinect-like face and speech recognition and gesture tracking capabilities. Adobe executives hinted that users can expect more software like Animal in the future. “Given the incredible technology they have across some of things they’re doing with Kinect and depth cameras and all the technology they’ve been working with from Xbox… that’s right there for us to work together on a collaborative basis ahead of where the creative community is right now,” said David Wadhwani, Adobe’s senior vice president and general manger of digital media. Adobe also previewed a new touch workspace in Photoshop on the Surface Pro 3, nicknamed “Playground.” Playground has all the power of Photoshop on the desktop, says Adobe, but a completely redesigned, touch-enabled, user interface. Layer Inspector, a feature within Photoshop’s Playground workspace, allows users to navigate between layers by swiping over them. One Playground feature, Layer Inspector, allows users to navigate between layers by swiping across them on their screen. The layers can also be picked up and rearranged solely with touch gestures. “The thing when we created Surface Pro 3 was to get touch and keyboard and mouse to be seamless and natural as a way to enhance productivity,” Nadella said during the demo. If that sounds familiar it’s because it sounds a lot like Microsoft’s Continuum feature in the newly unveiled Windows 10. If that sounds familiar it’s because it sounds a lot like Microsoft’s Continuum feature in the newly unveiled Windows 10. Continuum allows users to easily switch between tablet (touch) mode and “mouse and keyboard” mode when using hybrid two in one devices, like the Surface Pro.It’s not completely clear what the partnership between the two companies means for now— Nadella described it as having “new energy,” but didn’t elaborate on specifics. And Adobe is by no means shifting away from Apple (many of Adobe’s mobile apps are still iOS only.) But both CEOs made it clear they were committed to working together on innovative creativity applications. Each year, Adobe’s Max conference attracts some of the top creative professionals from around the world. By putting an $800 Surface Pro 3 (which Microsoft is still losing money on, by the way) in the hands of this group, Microsoft and Adobe are sending a very clear message: Microsoft already offered hardware Apple and other tablet makers didn’t and now, with Adobe support, it also has the software to match.